One Main Financial personal loans are designed for borrowers who need money fast. If you want access to money in the same day you apply for your loan, OneMain Financial can make that happen, provided you complete your application early enough. You can borrow between $1,500 and $25,000 for personal and auto loans from a lender who has been in business for more than 100 years, served over 10 million customers, and extended over $120 billion in loans. OneMain Financial claims that 5 out of 6 Americans live within 25 miles of a branch office, where on average branch managers have over 13 years of experience. While OneMain Financial has a lot going for it, you will pay a price for the convenience of borrowing from this established lender with an extensive network of locations nationwide because rates are not as low as those charged by some rivals. Why Choose OneMain Financial Personal Loans? If you need money fast and are willing to pay a premium to get your hands on cash quickly, OneMain Financial is worth checking out. OneMain Financial welcomes borrowers who have below average credit scores. If you need money in a hurry and don’t qualify for lower rates elsewhere, OneMain Financial may be a good choice because approvals are fast and money can be in your hands the same day. OneMain Financial looks at your income, expenses, and debt, as well as your past credit history to assess whether you are eligible for a loan. While you are eligible for a loan from OneMain Financial if your credit score falls below national averages, you will still need to supply standard documentation to be approved. You will also need to have established some level of credit history by having previously made regular and timely payments, even if over a short duration. And you must not have any bankruptcies lurking in your past financial history or you will most likely be declined. Like many other lenders, OneMain Financial favors employees with steady and predictable income versus self-employed individuals whose income may be spiky. The biggest question OneMain Financial wants to answer when lending to you is can you repay your loan. And to make an accurate assessment, the company will look into now only how much you earn but also how much you spend. When you take out a new loan, you need to be able to service that debt, and so it is important to assess whether you have enough cash flow to pay back OneMain Financial as well as to stay current with existing household expenses and other costly items. OneMain Financial loan applications can be started online and completed in branch offices. It’s easy to apply for a loan from OneMain Financial online but to collect your money you may need to visit a branch because loan disbursements are issued in the form of checks unless you choose the direct deposit option whereby funds are deposited directly into your checking account. If collateral is required, OneMain will conduct an appraisal to make sure that it is of sufficient value. Any active duty military personnel, spouses and dependents are covered by the Military Lending Act and are prohibited from pledging any vehicle as collateral. Once approved, you do have a grace period of a couple of weeks to return the loan proceeds if you decide you no longer want the loan. No interest will be charged to you if you make the decision. OneMain Financial does charge origination fees and late fees but won’t penalize you for paying off your loan early. Once you have been approved for a loan, payments can be made online, in a branch, by phone, mail, mobile device or even at a Walmart store. Keep in mind if you decide to pay at a Walmart Service desk, you can make a CheckFree payment but Walmart will charge you $1.00 → $1.50. And if you make a debit card payment, you will be will hit with a fee of $2.95. If you decide that you want to pay off your loan early, you won’t be penalized with any prepayment charges. OneMain Financial has been in business for over a century and served over 10 million customers. OneMain Financial began life in 1912 in Baltimore, Maryland under the name Commercial Credit. At the time, the lender provided working capital to manufacturers and building contractors. In 1999, the company changed its name to Citi Financial and then went through a string of acquisitions, initially purchased by AIG and then Fortress Investment Group before going public in 2015, after changing its name once again from Springleaf Holdings Inc. to OneMain Financial. The company operates in 44 states and has loaned out over $120 billion to 10 million customers for debt consolidation, auto purchases, household bills, home improvements, and other major purchases. However, if you are looking for a student loan or to use your money for tuition, you should consider other lenders, such as SoFi. And of course, you won’t be permitted to use your funds for any casino bets. OneMain Financial provides fast access to money and convenient branch offices to speak with real people but at the cost of higher interest rates than those charged by many other lenders. ✅ Fast Access To Funds: Loan applications, approvals and distribution of funds can take place as soon as the same day. ❌ High Interest Rates: Interest rates are high compared to many other lenders but few others can issue approvals and distribute funds as quickly. ✅ Extensive Branch Network: OneMain claims that 5 out of 6 Americans live within 25 miles of a branch. ❌ Lack Of Transparency: It’s not easy to find out interest rate and fee schedules from the OneMain website. ✅ Established Lender: OneMain has been around for over a century as an established lender that has loaned money to over 10 million customers. ❌ Hard Credit Check: When you apply for a loan, a hard credit check will be performed that may affect your credit score. ✅ Good For Poor Credit Borrowers : Even if you have a low credit score, around 600, you may be eligible for a loan. ❌ Credit Insurance: When closing your loan, expect OneMain to pitch you on credit insurance which may help pay off your debt if you can’t make payments but carefully examine the cost first. ✅ No Minimum Credit Score: No minimum credit score is mandated. ✅ Personal Loan Amount Range: Borrowers can take out loans as low as $1,500 and as a high as $25,000. ✅ No Prepayment Fees: If you decide to pay off your loan early, you will not be penalized with fees. ✅ Better Business Bureau: OneMain Financial earns an A+ rating from the BBB. If you don’t need money right away, shop around for other lower-rate lenders. Before applying for a new loan, it is a good idea to compare interest rates and eligibility criteria using a lending marketplace. If you are not in a rush to get your hands on money, other borrowers may offer better rates. Another lender that caters to borrowers with below average credit is Peerform, which has lower starting rates than OneMain. For borrowers with above average credit scores, SoFi is among the best lenders when it comes to competitive rates and all round service. Plus, you won’t get dinged with origination fees. OneMain Financial lends money to borrowers who may have poor credit and need access to money in a hurry. In as soon as the same day you apply for a loan, you can get access to anywhere from $1,500 to $25,000. The likelihood is you can walk into a branch to finalize your loan application because 5 out of 6 Americans live within 25 miles of a OneMain branch. However, you will pay a price for the convenience because the interest rates charged by OneMain tend to be higher than those charged by many rivals, though few can match OneMain in terms of the speed of issuing capital. 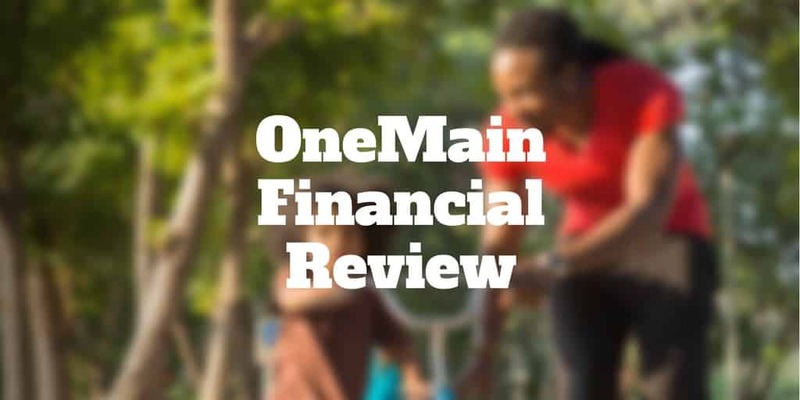 Having served over ten million customers and earned an A+ rating from the Better Business Bureau, it’s worth checking out OneMain Financial to see if it meets your borrowing needs.